Swimming with dolphins in the open ocean, hiking down a crater and gliding along on a Segway where cars can’t go are exciting and environmentally-friendly ways to explore Hawaii. Eco-tourism excursions allow us to enjoy and photograph pristine spots without disturbing natural areas. Getting around Waikiki on foot is easy. From the downtown, condo-style Aston at the Waikiki Banyan, we walked to beaches, shops and restaurants. But it was a Segway tour that took us off the beaten path. Segway of Hawaii (www.segwayofhawaii.com) has several guided tours that offer an insider’s look at bustling Waikiki. Our two-hour tour, Magic Island Glide Ride began with a lesson. We practiced balancing on the Segway’s platform positioned between two large wheels. Surprisingly easy to maneuver, we zoomed over paved pathways, sand and pedestrian bridges. Our two friendly guides chatted about passing scenery – the Duke Kahanamoku Beach lagoon, massive banyan trees, Ala Wai Yacht Harbor (home to million-dollar yachts) and Ala Wai Canal, before we stopped to rest at the Ala Moana Beach Park – a favorite with locals. Rates $109 per person, ages 10 and older. Oahu’s western shores have secluded beaches, lagoons and miles of rugged coastline. Resorts, such as the JW Marriott Ihilani Resort & Spa, nestle nicely into the landscape and have onsite kayaks and paddleboards for exploring lagoons. To see dolphins in their natural habitat, we sailed with Wild Side Specialty Tours (www.sailhawaii.com), an eco-tourism outfit staffed with marine biologists and naturalist. On our Morning Wildlife Cruise aboard Island Spirit, the crew briefed us about how to quietly swim alongside wild spinner dolphins and turtles without touching them. They told us to mimic the dolphins’ behavior. Basically, if dolphins are relaxing, we should swim quietly; if they’re playful, we can splash along. At our first snorkel stop, we saw several turtles. Next, we sailed where dolphins typically frolic in the azure waters. Water cameras in hand, we quietly paddled near the resting dolphins. On more active days, dolphins swim in large pods surrounding snorkelers. Rate: $115 includes snacks and lunch. A portion of the fees are donated to the Wild Dolphin Foundation for marine conservation and education. The Polynesian Cultural Center features seven Pacific Island villages where you can learn ancient Hawaiian games and watch cultural shows. www.visit-oahu.com. Our trip on Hawaii’s biggest island began in the non-tourist town of Hilo, known for black sand beaches with sparkling turquoise water. Locals recommended we visit Rainbow Falls (best seen by 10 a.m.) and the Hilo Farmers Market. What deals! We bought pineapple bananas ($1 for five) and vegetarian manapuas (steamed dumplings, $3 for two) and enjoyed a beach picnic. First stop: Visitors Center for a short video about the park, a 333,086-acre UNESCO World Heritage Site with an active volcano (Kilauea), lava tubes, volcanic cinder, lush forests and steaming vents of varying sizes. A six-mile Crater Rim Drive leads to scenic points. We joined a ranger-led hike along the crater rim to the massive Nahaku (Thurston) Lava Tube, a 500-year old cave formed by liquid lava rocks. Afterwards, my son and I hiked the Kilauea Iki trail through a colorful tropical forest to the stark crater floor. Small plants poking through crevices, rocky terrain, and steaming vents exude a surreal ambiance. 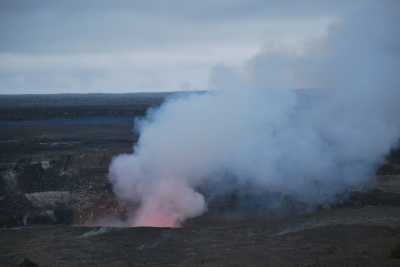 At sunset, we headed to the Jaggar Museum overlooking the crater, where we watched in awe as the steam plume gradually changed color from white to yellow, orange and red. From Hilo we drove to Waikaloa, stopping to hike at Akaka Falls. 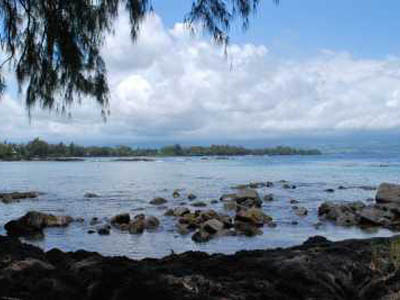 Our next eco-tour was Ocean Sports’ Black Sand Picnic Snorkel (www.hawaiioceansports.com) along the Kohala coast. Marine naturalist guides discussed how to snorkel without disturbing marine life. Our guide led us to coral gardens abundant with colorful fish and purple sea urchins. $147 adults, $73.50 kids, includes breakfast, lunch and drinks. Kids under six sail free. It felt strange to bundle up (on an island!) for our next activity: Hawaii Forest & Trail’s seven-hour (round-trip) Mauna Kea Summit and Stars Adventure tour (www.hawaii-forest.com). Led by a geologist, the tour includes dinner at a mid-point up the 13,796-foot mountain that gets snow in winter. We arrived at the chilly summit (parkas are provided) in time for a spectacular sunset. Our guide pointed out constellations and set up a telescope so we could clearly see Venus, Saturn and other night sky wonders. 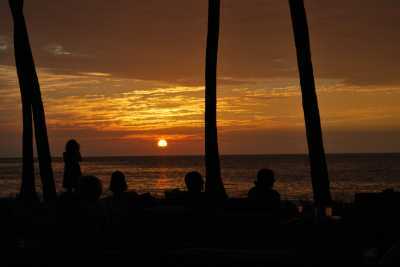 Our favorite meal was at the Lava Lava Beach Club, a casual restaurant right on the beach. Yummy food and the best place to watch a Hawaiian sunset while dining. Posh Hali‘i Kai at Waikoloa condos (http://www.haliikairesort.com/). A mom of three, Mimi Slawoff writes a monthly family travel for L.A. Parent magazine and freelances for several outlets. Follow her adventures on Twitter @mimitravelz and www.writemimi.com.